With the German army overstretched and weakened after their Spring Offensive, the Allies launched a counter-offensive in the summer of 1918. This became known as the Hundred Days Offensive, opening with a French attack on the German line near Paris. 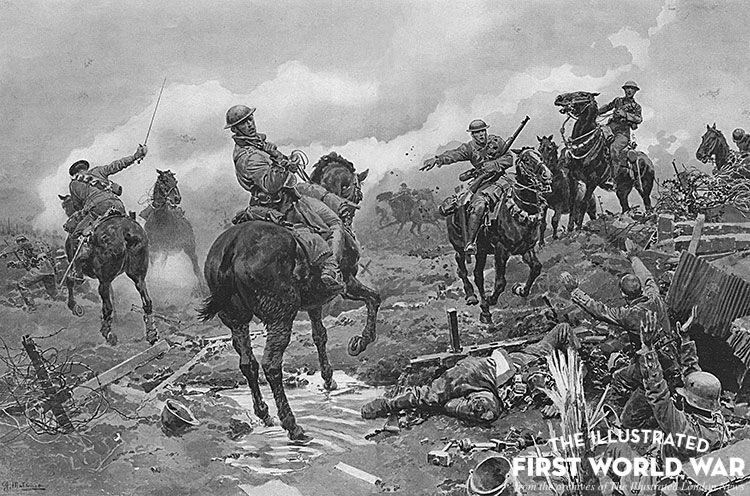 The first French counter-offensive received abundant attention in the pages of The Illustrated London News. It was announced that Marshal Ferdinand Foch, recently appointed Commander-in-Chief of the Allied forces in France, had selected General Fayelle to lead the attack. In a combined Franco-American offensive, the Allies fought furiously to drive the German army back from the Marne and established the first victory of the Allied counter-offensive. Over the next few months the Allies fought the Germans back through France and Belgium in a series of skirmishes. Central to this was the Battle of Amiens on 8 August 1918. The Germans at Amiens had not had time to build-up their defences, and the British Expeditionary Force’s combined artillery, infantry and tank offensive was launched with devastating effect. The ILN noted that although the Allies suffered heavy tanks and aircraft losses, they had captured several thousand troops in return. In fact, the German army suffered 27,000 casualties and around 15,000 troops surrendered. The American Expeditionary Force had a similar experience with their attack on the Saint Mihiel salient – 13,000 German soldiers were taken prisoner. The “liberation of Amiens” was portrayed by the Great Eight publications as a feat of supreme bravery and resilience by the Allies. The failure of the German Spring Offensive and the success of the Allied counter-offensive had a disastrous effect on German morale. At the German High Command, even Ludendorff was forced to conclude that the German Empire could not win the war – he described Amiens as the “Black Day of the German Army”. Germany’s hope rested on securing a favourable peace treaty with the Allies. They still held control over much of Eastern Europe and France, which could be used as leverage. However, the Germans had lost a huge expanse of territory in the Hundred Days Offensive and their only hope lay in mounting a defensive position at the Hindenburg Line. Although composed of a series of fortifications and natural barriers, even the Hindenburg Line failed to halt the Allied advance. According to the ILN, the line was broken by the Allies on 3 September between Quéant and Inchy. By the end of September a series of four major Allied offensives had overwhelmed the Germans who were forced into an all-out retreat. The final phase of the war was characterised by a relentless German withdrawal. Though the war had been all but won, small skirmishes continued right up to the signing of the Armistice on 11 November 1918.